Color Corps is present at funerals, church dedications, confirmations, weddings and special occasions- White House and Papal escorts. You do NOT have to join the color corps. Current cost for regalia including sword, cape, chapeau, etc. is about $500. We march in the July 4th parade in Huntington Beach. NEXT EXEMPLIFICATION: Saturday, September 14, 2019 at the Christ Cathedral Campus. Submit Form 4 signed by Financial Secretary and date of First Degree. CLICK HERE FOR Membership Information for the October 13, 2018 degree. Items to Remember for Fourth Degree ExemplificationThe dress for the Fourth Degree Exemplification is black, navy blue or dark grey business suit, dark tie, plain white shirt (NO button down collar), black shoes. No sport coat. Religious and members of the armed services may wear their clerical garb or dress uniform respectively. NO lapel pins and jewel of office to be worn during exemplification by candidates. You must have your Third Degree membership card with you for the Fourth Degree Exemplification.Any Third Degree member in good standing is eligible for membership in the Fourth Degree.A Ladies Luncheon is provided for your wife’s entertainment and enjoyment during the actual Exemplification ceremony. Our Assembly number is 3479. Ladies look for Assembly 3479 tables. Evening banquet tickets will be distributed in the lobby of the hotel only. Seating at tables is assigned by the District Master. You can NOT switch seats. If you wish to sit together as a group, you MUST provide this information to the Comptroller at the information meeting. You do not have to purchase the new uniform to join the assembly. NOTE: A dark suit may be worn for the exemplification. We invite members of your Council to join the Fourth Degree. Sir Knights of the Fourth Degree, deem it an honor and privilege to carry our TRIAD EMBLEM, which features The Dove, The Cross, and The Globe. Our Honored Order cherishes as its Patron, Christopher Columbus. 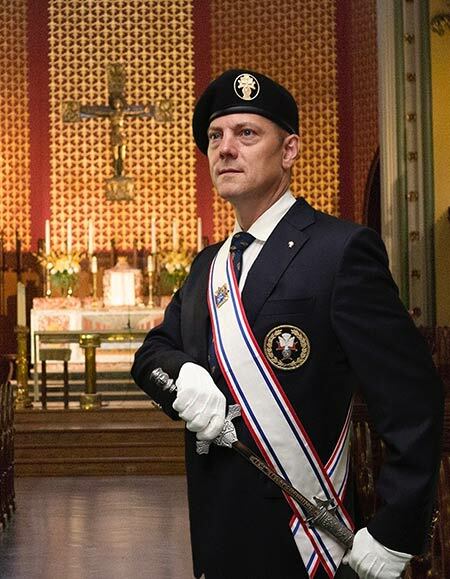 The primary purpose of the Fourth Degree is to foster the spirit of patriotism by promoting responsible citizenship and a love of and loyalty to the Knights’ respective countries through active membership in local Fourth Degree groups called assemblies. Fourth Degree members must retain their membership as Third Degree members in the local council to remain in good standing. As a Fourth Degree Knight you have the opportunity to become part of your assembly’s color corps. As a color corps member, you will be recognized widely by the distinctive attire of blazer, beret and sword. 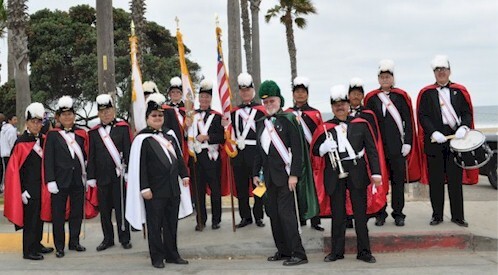 Color corps members regularly take part in civic events such as parades and wreath-laying ceremonies, and in ecclesial functions at Catholic churches. dark-gray slacks, a blue Fourth Degree tie, white shirt, and a black beret with the Fourth Degree Emblem. uniform. He does not wear a baldric. Each council of the Knights of Columbus shall be affiliated with an assembly of the Fourth Degree. This format is more of a managerial format with regards to Call Out Jurisdiction and promotes a support system between several councils and a specific Assembly. In most cases the majority of a council’s members who are also Fourth Degree Knights belong to the same assembly but it is not a requirement. Recruiting Membership from Councils in an Assembly’s Jurisdiction. Formal recruiting programs by an assembly can only take place in the councils under their jurisdiction. Other assemblies should respect this and not conduct recruiting drives outside their jurisdiction.